Are you ready for this? Tuesday is a big day! That's the day, I will be hosting the first Fallen book discussion. To kick it off, today I am giving away some special stuff. Lauren Kate has offered to give some signed copies of her books, so that is exciting. Thank you so much, Lauren Kate for some awesome signed books! 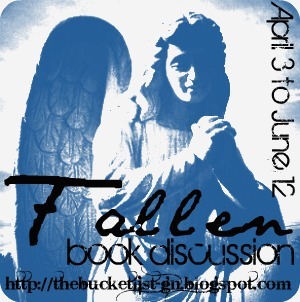 I will be giving away a copy of one of the Fallen books to two lucky winners. That's right! Two winners. Comment! That’s basically all the work you have to put into this. Every comment you post on our discussion posts (and no, it can’t be a comment about something off topic- you must stay with the discussion) will add you an extra entry in the giveaway. For each comment, you receive +1 as an extra entry. You don't have to be a follower, but how else will you keep up with this awesome discussion? Due to money issues, I cannot make this contest international. However, if you, international folks, have USA friends, we could always send the gift to them who then could pass it on to you or if you are willing to pay for shipping and handling, we would gladly send the gift to you. Those who are up for this contest—the deadline is 6/13/12. On 6/15/11 we will post the winner of the book. (You will have 48 hours to claim your prize from that date.) Just fill in the form below, if you qualify, and don’t forget to comment. Other things to remember: This is how the book discussion will run: Each week we will go over the plot of that week's two chapters. Tomorrow, I will be posting the schedule to the discussion, so you will never miss a post. We will reflect and discuss favorite scenes, random thoughts, and other awesome stuff. At the end of each post, there will be discussion questions for anyone who would like to join in on the fun. What are we asking you to do? Read along with us and comment every week! This book discussion is going to be so much fun and it would be even more so if you'd join us! So stay tuned! (Every discussion post will take place on Tuesday.) Since every Monday is Movie Monday and this book, Fallen by Lauren Kate, has already been optioned for film: we will be giving you our dream cast every Monday with a new character for even more awesome discussion! So bring on the comment love and don't forget your copy of Fallen. Yay with all the new followers! Thanks for the giveaway and the feature!!! in time i am reading this fantastic educational piece of writing here at my residence.